In December 2018, crews completed this project by converting the existing Colorado Highway 340 (Broadway) and Redlands Parkway intersection into a roundabout. The team also resurfaced the roadway, reconstructed pavement, improved guardrail and drainage, replaced striping, and upgraded sidewalks to comply with the Americans With Disabilities Act (ADA). See safety benefits of roundabouts. From 2010 to 2015, there were 28 crashes at this intersection, the vast majority of which were left-turning, rear-vehicle collisons. 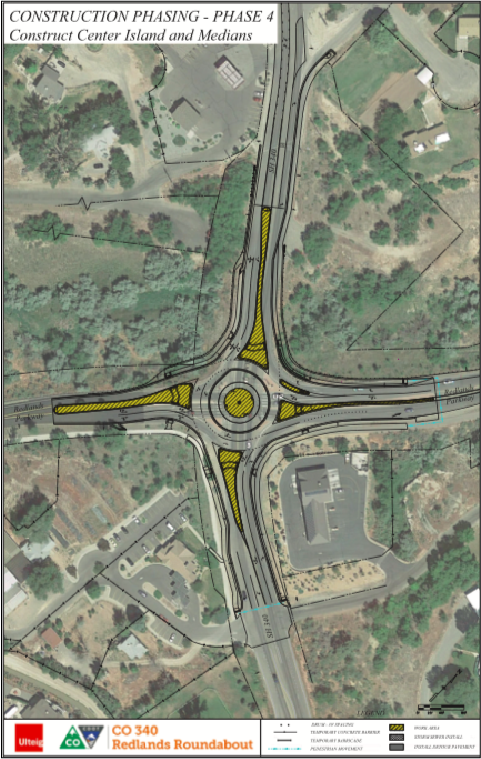 Improving the safety of the CO 340 and Redlands Parkway intersection is CDOT's top goal, in addition to enhancing aesthetics of the intersection and addressing future projected traffic volumes. Because roundabouts are so effective at reducing these types of accidents, CDOT can improve the safety at the intersection by constructing a roundabout. There are no further traffic impacts. Project is complete. Work will consist of: installing curb and gutter in the pork chop and center island, fabric, median cover stone, installing permanent light poles, and final striping.